Welcome to JimmyGay.com - The official site of Jimmy Gay. Who is Jimmy Gay you ask? Me bro. Greetings. This post is a response to my buddy Joe's entry in my guest book. 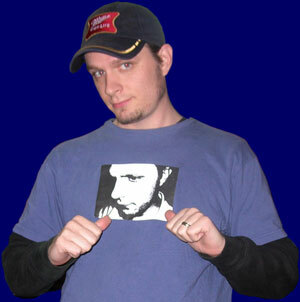 I quote "It's not enough that you have a T-shirt with your picture, you have to put it on the website too? Talk about narcicism." Touch? my friend. Nice spelling by the way. This is not the first time I have been accused of narcissism, and, I am quite certain, it will not be the last. As for the shirt, look at it. I SAID LOOK AT IT!! Come on, it's funny. That was my intention anyway, and as I have worn it on several occassions, that has been the general response. When I first made it some months ago, my wife took one look at it, rolled her eyes and basically said the same thing Joe said (I'm probably remembering this incorrectly, and believe me, I'll hear about it - wait, Shelly doesn't read my blog - anyway...). She actually thought it was funny, but she thought that, outside our circle of friends, people wouldn't get it. She said, "Peolpe are going to think you're a conceited jerk." To which I responded, "Yeah?" (FYI - it went something like that, not exaclty - please refer to my previous aside). I didn't agree. I mean, I think if I saw somebody walking down the street with a shirt with their own face on it, I would think it was hilarious (that is, I would have thought that before I made this shirt. Now, I'll just think they're a copycat.). I was (am) of the opinion that most people would feel the same way. Recently, I got an opportunity to put my theory to the test. A couple of weeks ago, we went to a Saint Patrick's Day parade in Jefferson (for pictures of Allee at the parade, click the "Allee Pics" link to the left. She's so cute. Go ahead. Check it out. Really. Go now. I'll be here when you get back.). I wore the infamous shirt which got me, before we left, the eye roll. Well, response from our friends was predictable. Three requests for shirts, including one from Joe's wife Jackie (Hmmmm, interesting. That guestbook entry is starting to make sense. To see my initial response check out the guestbook. While you're there sign it). But I was more interested in the response at the parade from people I didn't know (or hardly knew). Well, you guessed it, the shirt went over like gangbusters. People not only thought it was funny, but actually kind of cool. So, you tell me: narcissist or comic genius? (narcissistic comic genius) Suffice it to say, I gloated a bit. p.s. (oh god, just shut up!) I'm thinking of running some kind of contest to guess the quotes I sign off with. I haven't worked out the details. Any interest? Oh, right - nobody reads this. Wait... what's that you say? You missed one of my webessays? Fret not dear reader (we all make mistakes). Just click here for a list of previous entries. Enjoy. Though why you would want to is beyond me.